A rich and moist chocolate cake recipe that tastes indulgent but still complies with the dietary restrictions of the Lenten season. Sift the flour, baking soda, cocoa powder, and salt into a mixing bowl and mix using a whisk. In a separate bowl, combine the sugar, vinegar, vanilla extract, vegetable oil, and water. Whisk together until the sugar is dissolved and the wet ingredients are combined. Add the dry ingredients to the wet ingredients and mix until incorporated and a smooth batter forms. Mix in the chopped nuts if using. Lightly oil a 9 x 13 baking pan or spray with cooking spray to prevent sticking. Pour the batter and smooth the top with a spatula. Bake in a preheated 350 F oven for approximately 45 minutes or until a tester inserted into the center of the cake comes out clean. When the cake has cooled, serve with a dusting of confectioners sugar and enjoy. This recipe can also be used to make cupcakes. It will yield approximately 24 regular cupcakes or 48 mini cupcakes. 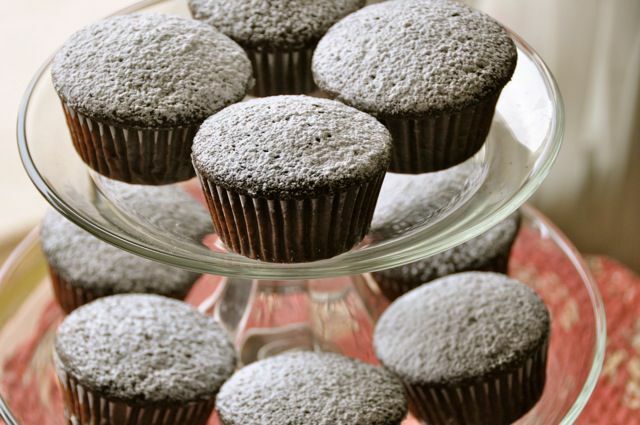 For cupcakes, reduce the baking time to 20 minutes.